Police in Garland, Texas say the two men who were fatally shot outside a controversial event there on Sunday would have killed visitors had they not been stopped. Harn said authorities were approached by the organizers of the event months earlier and recommended the planners purchase $10,000 worth of security services for the supposed art expo. Uniformed police officers, SWAT personnel and federal agents were at the event on Sunday, Harn said, and responded to reports of shots being fired within seconds. 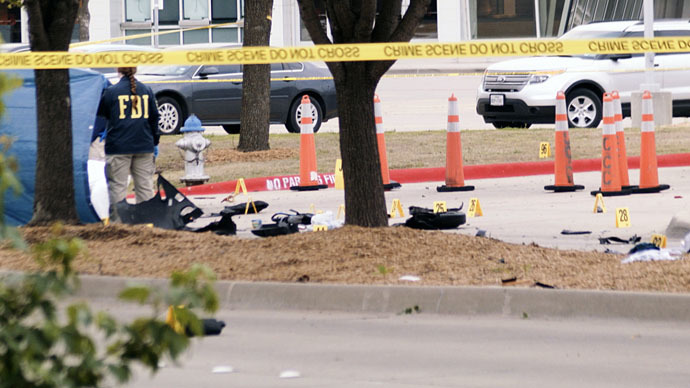 According to Harn, a dark colored vehicle pulled up to the west parking lot of the Curtis Culwell Center in Garland just before 7 pm local time on Sunday. A police cruiser was stationed at the entrance and blocking access to the lot, Harn said. The officers exited and attempted to approach the sedan when its two occupants left the vehicle and began shooting. “From what it appears, they simply got out and started firing,” Harn said on Monday. A traffic cop shot at both men with his pistol, Harn said, killing them. “Both of those men died there on the street next to their car,” Harn said. Harn said that the Curtis Caldwell Center, which is owned and operated by the Garland Independent School District, remains an active crime scene as officials continue their investigation. Sunday’s event was organized by the American Freedom Defense Initiative, an organization that the Southern Poverty Law Center describes as being composed of anti-Muslim extremists. “They’re just cartoons. We’re holding this exhibit and cartoon contest to show how insane the world has become — with people in the free world tiptoeing in terror around supremacist thugs, who actually commit murder over cartoons. If we can’t stand up for the freedom of speech, we will lose it — and with it, free society,” she told Breitbart. Harn declined to identify the suspected gunmen or the authorities involved during Monday’s press conference, but ABC News previously said one of the shooters was Elton Simpson of Arizona, citing an unnamed official with the Federal Bureau of Investigation. It was reported earlier in the day that the FBI had been searching Simpson’s home in Phoenix shortly after the Sunday evening incident.